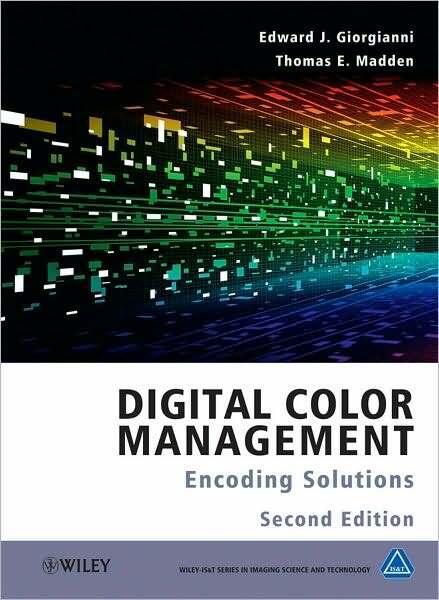 Edward J. Giorgianni, Thomas E. Madden "Digital Color Management: Encoding Solutions, Second Edition"
All successful imaging systems employ some form of color management for previewing, controlling and adjusting color throughout the image-production process. Today’s increasingly complex systems pose challenging problems: they must support numerous devices and media having disparate color properties, and they also must provide for the interchange of images among dissimilar systems. In this book, the authors address and solve these problems using innovative methods of representing color in the digital domain. •	four new chapters, two new appendices, and more than 80 new figures. 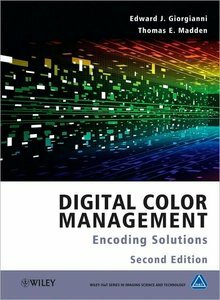 This book is an essential resource for engineers, programmers and imaging professionals designing and engineering color-imaging systems and for others simply looking to increase their understanding of the field. Scientists, researchers, advanced undergraduates and graduate students involved in imaging technology also will find this book of significant interest and usefulness.